Stark Findings In First Comprehensive Assessment Of Water And Hygiene In Health-Care Facilities : Goats and Soda A new report offers the first comprehensive assessment of water, sanitation and hygiene in health-care facilities in low- and middle-income countries. A new report finds that many health-care facilities in poor countries lack any sort of water supply. Go to the hospital or a clinic in a wealthy country, and you take it for granted that there's going to be enough clean water — for the doctor to wash her hands before she attends to you, for the staff to clean the floors and linens, and for you to drink when you get thirsty. But in 17 countries at least one in five health-care facilities has no clean water service on site. That's just one of many disturbing findings in a new report by UNICEF and the World Health Organization. That data, collected in 2016 from 69 low- and middle-income countries and territories, amounts to the first comprehensive global assessment of water, sanitation and hygiene in health-care facilities ranging from hospitals to rural clinics. • The problem is particularly common in Africa, but there's a lot of variation on the continent. For instance, in Namibia only 1 percent of health care facilities have no water service, while in Liberia more than half of facilities go without. Meanwhile several non-African countries also perform poorly by this measure including Myanmar, where 27 percent of health care facilities lack water service, and Peru, where it's 18 percent. • Soap is also in short supply. 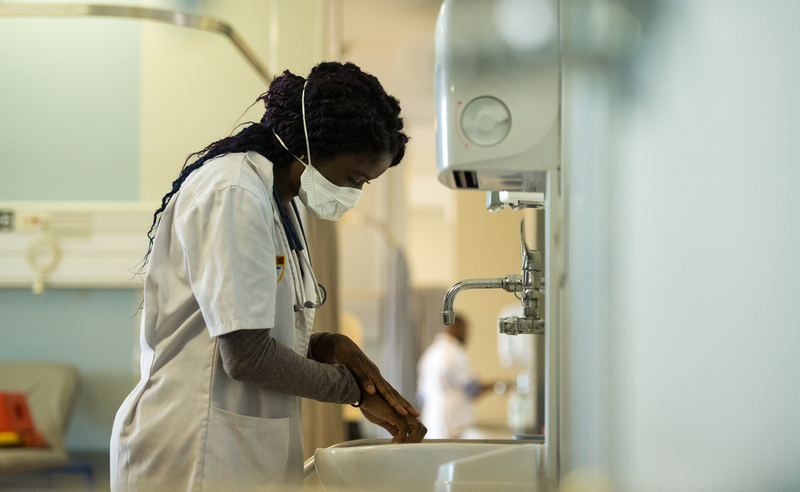 One out of six health-care facilities covered by the report have no hand hygiene service, meaning not just no soap and water but not even alcohol-based hand rubs available. • And there's a serious lack of toilets. One in five health-care facilities – including almost one in ten hospitals — does not have toilets beyond rudimentary set-ups like pit latrines and bucket latrines. This means more than 1.5 billion people are getting their care at health facilities with these conditions. • Waste disposal is a challenge too. In 30 countries more than half of the health care facilities lack basic waste management services – meaning that infectious waste is not treated and disposed of safely. • All this contributes to both maternal and infant mortality. The report authors estimate that each year 17 million women in the world's poorest countries give birth in health centers with inadequate water, sanitation and hygiene. This increases the chance of deadly infections in both mother and newborn.